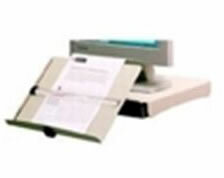 Description: In line document holder keeps reference materials in comfortable position, and stows away. 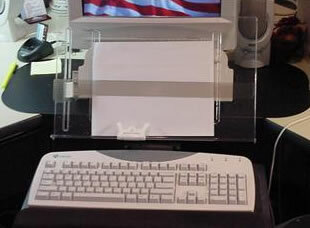 The use of an in line document holder is the best way to view documents while at the computer. Whether you are transposing , entering data, or intermittently referring to documents, having documents centered and in line with the head and neck minimizes your risk of neck pain and fatigue. Document holders that are to the side of viewing causes you to leave the neutral viewing zone and requires that you imbalance your posture by moving your head and neck to the side. Additionally, reading and writing on documents located on your desktop can cause you to lean forward. 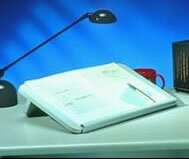 A read write slant board angles documents toward you so you can maintain good head, neck, and back posture.